Therapeutic Massage . . .touching was and still is and will always be the true revolution. Massage is the most natural and instinctive means of relieving pain and discomfort. It is an instinctive impulse to touch and rub the body to obtain relief. Tender Luving Services integrates a variety of modalities to create a client-centered (not a spa or cookie-cutter massage) session that relaxes, relieves pain and gives a greater sense of well-being. Enerssage – $100.00 A 75-minute session massage including Reiki healing. 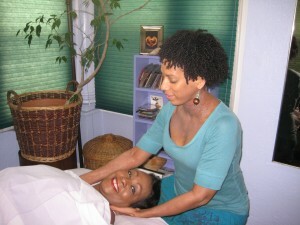 A two-hour session including suggestive therapy, massage, and Reiki. Aqua Chi Detoxification Therapy: Every human being is the author of his or her own health or disease. Germs exist at a specific frequency. When that frequency is disturbed by short waves generated by a direct current, the germs disintegrate thereby creating an environment where the cells are restored to electrical balance. Come place your feet in a bath of water and let the aqua chi ionic machine detoxify and heal your body without pain or drugs. If you are on medications, feeling depleted, depressed and/or out of balance, try aqua chi therapy to create a feeling of well-being! Each day, and in every way, I am getting better and better! Hypnotherapy is the clinical use of hypnosis in which a person’s powers of concentration are mobilized and subconscious memories and perceptions are brought into consciousness. Through the use of progressive relaxation and suggestive techniques one can fully relax into an alpha state where the mind is better able to receive information to assist in bringing about psychological and physical changes. Hypnotherapy can be used to overcome migraines, obesity, heavy smoking, fears and phobias, low self-esteem and other disorders. Reiki is the Japenese word for Universal Life Energy. Come experience this calm and gentle spiritual life force energy. This non-invasive healing modality is for the whole person including body, emotion, mind, and spirit. Relax and raise your vibration to improve your health and enhance the quality of your life. Be still and feel the peace that comes with Reiki. . .
Reiki classes offered on a regular basis. . .
A 75 minute session massage including Reiki healing.